If simplicity is a virtue, Rick Marotta is a fine man indeed. Marotta's ability to lay down the perfect groove unburdened by ego and needless complexity, has enshrined his drumming on records by Aretha Franklin, Carly Simon, Steely Dan, James Taylor, Paul Simon, John Lennon, Hall & Oates, Stevie Nicks, Wynonna, Roy Orbison, Todd Rundgren, Roberta Flack, Peter Frampton, Quincy Jones, Jackson Browne, Waylon Jennings, Randy Newman, Kenny G., the Jacksons, Crosby, Stills & Nash, and many others. He has also worked extensively as a producer, music director, and film and television composer. The more I heard other guys play, the fewer I would play. Marotta's less-is-more attitude is all the more distinctive given that he came of musical age during the '70s, when showy drum work was the norm. "That's how I developed my attitude in the first place," he says. "When I was coming up as a musician, there were a lot of truly great drummers like Neil Peart and Terry Bozzio, guys who played a lot of notes and did it very well. But the more notes I heard other guys play, especially in fills, the fewer I would play. At first, it was just a matter of taste, but then I started getting a lot of session calls because of that attitude." Remarkably, Rick never hit a drum until he was 19. "As far as I'm concerned," he says, "that was a great advantage! I just took these drum sticks the size of baseball bats and started hitting the drums as hard as I could. I still believe that just flailing away is a great way to start out on an instrument. If you have any talent at all, it will come out. After that you can go back and learn the rudiments." Marotta's straight-ahead attitude hasn't prevented him from creating innovative parts that not only contributed to memorable hits but have also been studied and imitated by countless other players. "If you play simply," argues Rick, "you can even play freakier, more imaginative stuff in a tasteful way." He cites examples from his own work: 'Hour That the Morning Comes', from James Taylor's Dad Loves His Work, where Rick cemented the offbeat parts via careful repetition, and the syncopated, deep-pocket patterns of 'Peg' from Steely Dan's Aja. "I suppose," says Rick, "that the sessions I'm proudest of are ones like that, where I played something different from what everyone else was doing at the time. But on the other hand, I really liked some of the ones that were just plain simple, like James Taylor's 'Walking Man'." Today, Marotta keeps it not only simple, but small: One of his current kits is a compact Yamaha Hipgig set. "It's a small kit where all the drums fit into each other," he explains. "Some people see it and think it's a toy, but it sounds amazing. I use it on a lot of gigs. When I played the Hipgig kit behind Sheryl Crow, everyone freaked out at how good it sounded. Same with Michael McDonald - everyone was talking about the great drum sounds. That little 16" bass drum sounds like a 20". It's punchy, with a lot more depth than you'd expect. The small snare drum sounds great too, especially with the added-on wood rim. It's a great crossstick sound. I turned my brother on to the kit (Rick's younger brother is Jerry Marotta, another top-tier session man). He tells me that he uses them all the time, because the bass drum sounds so unbelievable. He's been swatting them hard, and he's a bigger guy than me. And now I hear that a lot of guys are showing up with them at sessions here in LA." Marotta has accepted fewer drumming gigs as his composing career has accelerated. 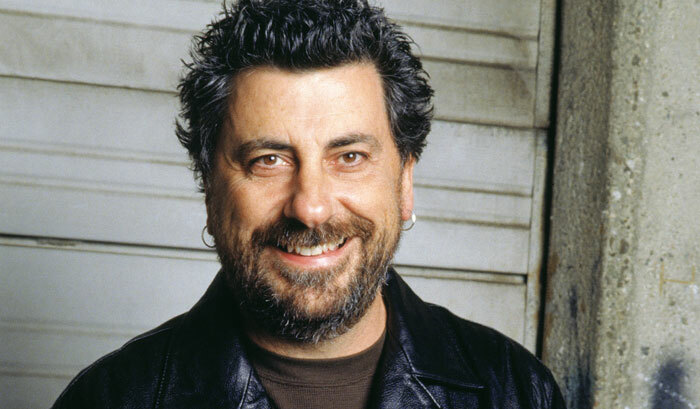 (He is currently scoring three TV shows: Everybody Loves Raymond, Imagine That, and Yes, Dear). But even if Marotta is writing more parts than he's reading these days, his philosophy remains the same: "I bring to composing the same attitude I bring to drumming," he says. "Simple is usually better."